The new federal law on education, ESSA, is SOLD as if the Feds return power to the states. Only politicians would lie and tell you that a 1061 page federal law returns power to the states. Why does ESSA give unprecedented power to the U.S. Secretary of Education that requires him to approve “state plans” that include the academic standards? Those state plans have to coordinate with 11 federal statutes which means they must BE Common Core or something LIKE Common Core. DO not be fooled. ESSA doesn’t get RID of Common Core, it embeds it in our state. This FRIDAY at 10:30 am, the NH Commissioner of Education, Virginia Barry will offer a presentation to the Education Committee at the Legislative Office Building Room 207 on ESSA. Parents are encourage to attend this meeting to hear our Commissioner explain this new law. Will she explain how ESSA codified in law the expansion of pre-school programs? And at the same time explain how the Head Start program has been a drain on taxpayers with no real results to speak of? The Head Start studies showed Head Start was a failure but ESSA will expand the push for universal pre-school. Will she explain that ESSA federal testing requirements are aimed more at assessing your child’s attitudes and dispositions versus academic knowledge? As part of the ESSA law, states must come up with a PLAN for education that includes a “FAMILY ENGAGEMENT PLAN.” The US Dept of Education (USED) is supposed to come up with their own Family Engagement Plan that states MAY adopt, if they don’t want to do their own homework. This entry was posted in Legislation, Miscellaneous and tagged CommissonerBarry, ESSA on January 11, 2016 by SCC. 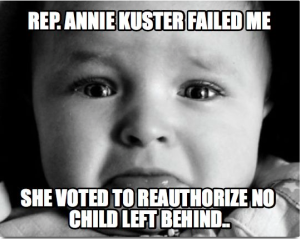 This entry was posted in Legislation and tagged AnneKuster, ESEA, NoChildLeftBehind on December 4, 2015 by SCC. URGENT: Cong. 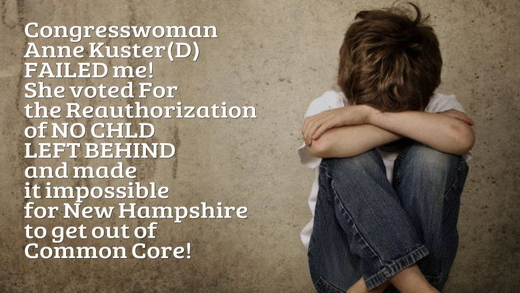 Anne Kuster stabs every NH child, teacher and parent in the back! 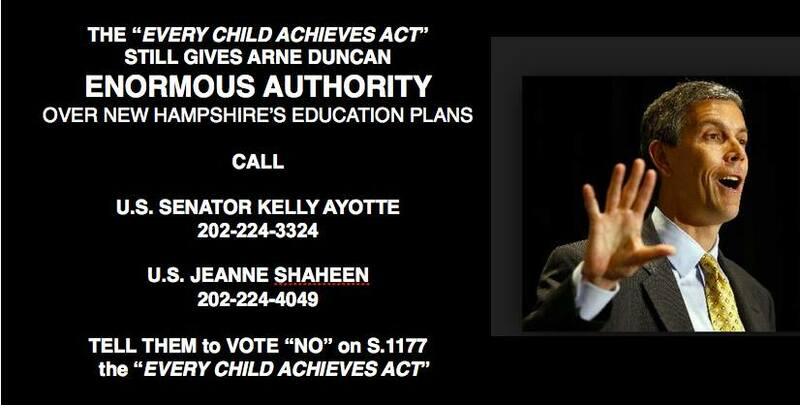 We have been fighting against the reauthorization of No Child Left Behind for several months now. It began with the U.S. House drafting H.R.5 and the U.S. Senate drafting “Every Child Achieves Act”. After each bill passed the House and Senate, they were then sent to a Conference Committee to come up with a final Bill. That final Bill was released with over 1,000 pages and voted on within a few days giving the public and their elected House members a short time to read and identify the numerous problems that still existed. On December 2, the U.S. House voted to reauthorize the Elementary and Secondary Education Act of 1965. How did your New Hampshire representatives vote? In other words, Cong. Anne Kuster just stabbed every NH child, teacher and parent in the back with her YEA vote. This also means that Cong. Frank Guinta is due a big THANK YOU from all of his constituents. 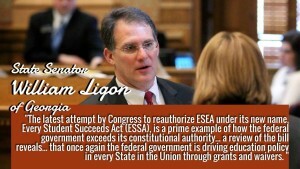 What again is so wrong with reauthorizing the failed federal education reform, No Child Left Behind? We can look at a letter sent to the new Speaker of the U.S. House, Paul Ryan, from a State Senator in Georgia, William Ligon. “As for ESSA specifically, here are a few of the issues that I find troubling in the bill. Although Section 8544 (p. 859) assures us that States face no penalties for withdrawing from the Common Core standards or for otherwise revising their standards, ESSA requires that state standards must align with higher-education requirements. Since federal mandates have already ensured that our colleges and universities have aligned their entrance requirements with Common Core (known as College and Career Ready) then it would appear that we again have an entire process, both lengthy and expensive, to readdress college entrance requirements before Georgia could exit the Common Core. Furthermore, ESSA still requires “career and technical education standards” that must align to the federal Workforce Innovation and Opportunity Act (WIOA). It is also apparent that ESSA still requires state educational plans, which includes standards, to comply with 11 existing federal statutes, and that the Secretary of Education must sign off on these plans (Section 1005, amending Section 1111(a)(1)(B), pp. 38-39). These statutes run the gamut from Head Start to WIOA. As with all the previous reform legislation from Goals 2000 onward, this bill is intertwined and additive to the overall federal framework for education. ESSA may mitigate some of the onerous effects of NCLB, but it continues to advance the top-down, federal reform agenda. We encourage you to read the letter in full to get all of the details. As the Republican presidential primary unfolds, it’s pretty clear that the outsiders have an advantage among the Republican voters. Why? Because it’s obvious that the establishment is not listening to their constituents. Republican voters are angry that their voices are not being heard in D.C. or by the Republican Governors. (Remember, Gov. Jeb Bush supports this reauthorization) Voters are angry that legislation like this can be put forth and supported by Republicans. We are fortunate that our Republican Congressman Frank Guinta (R) listened to the parents and teachers in New Hampshire. But many, including Anne Kuster (D) and the Democrats in D.C., did not. This entry was posted in Legislation and tagged AnneKuster, ESEA, FrankGuinta, House, NoChildLeftBehind, reauthorization on December 4, 2015 by SCC. S. 1177 needs to be stopped. Not only is it a dangerous bill, but the U.S. Senate violated basic civic procedure In Reauthorization of ESEA. There were NO PUBLIC HEARINGS for parents. 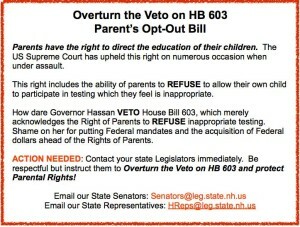 Why don’t our Senators want to listen to parents? 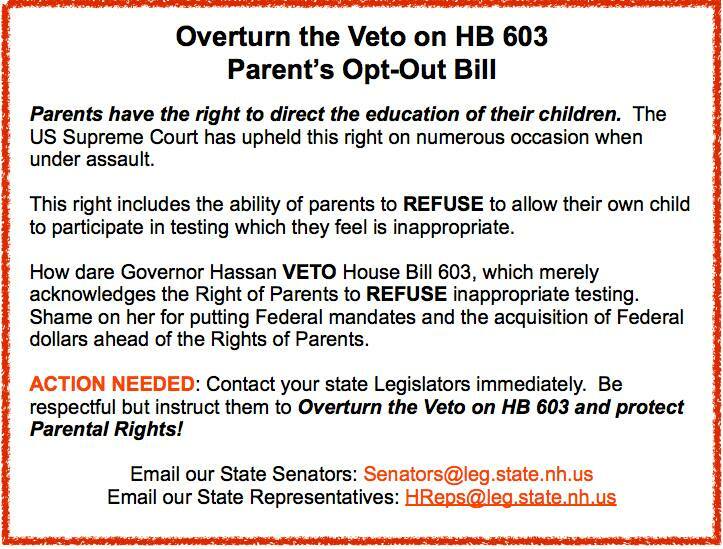 Please tell your two Senators to vote “NO” on S. 1177. 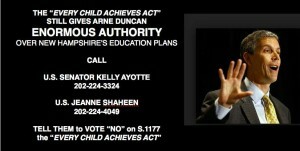 This entry was posted in Candidates, Legislation, Political and tagged ESEA, NoChildLeftBehind, reauthorization, S.1177, SenatorAlexander, SenatorAyotte, SenatorShaheen on July 7, 2015 by SCC. This entry was posted in Legislation, Smarter Balance and tagged Legislation, Maine, SBA, SmarterBalancedAssessment on June 18, 2015 by SCC.